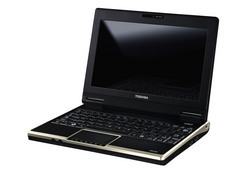 Not that long ago we filled you in on details of Toshiba’s foray into the Netbook market. Well now we can reveal where you can purchase one, and the pricing is pretty attractive. Get yours at the Carphone Warehouse for only £30 pcm. Toshiba’s NB100 seems to tick all the correct boxes for a Netbook. Large enough screen? With 8.9 inches that’s definite tick. Super light? Only 1.05 kilo’s, so check. Huge hard drive? 120GB’s my friends. Multi-ports? Only an Ethernet port plus 3 USB ports, and an integral webcam. You can either buy it on contract or as a standalone, but seeing as the contract plan includes two years connectivity to the net, I think I know which option I’d go for. £30 per month at the from Carphone Warehouse on a 24 month contract with O2, Orange and T-Mobile.